1 gluing paper | This Blog Rules | Why go elsewhere? Origami (from oru meaning “folding”, and kami meaning “paper”) is the traditional Japanese art of paper folding. 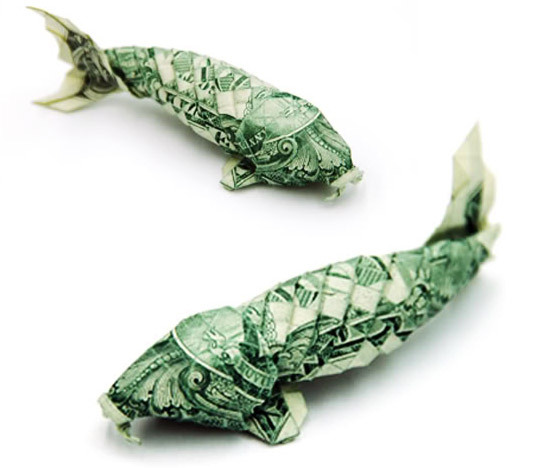 The goal of this art is to create a representation of an object using geometric folds and crease patterns preferably without the use of gluing or cutting the paper, and using only one piece of paper, or in this case, a single dollar bill, hence the name “money origami.” The creativity of the little critters that people have designed from their currency is astounding: the one-eyed crab below is even borderline frightening.